COOK: Quinoa — Queen of Casseroles | CookDrinkFeast! I got my first taste of quinoa under a bridge. Well it was the under the I-83 viaduct at the Baltimore Farmers’ Market & Bazaar. The Mushroom Stand sells a mushroom and quinoa dish that is virtuous yet meaty (although there is no actual meat) and satisfying. 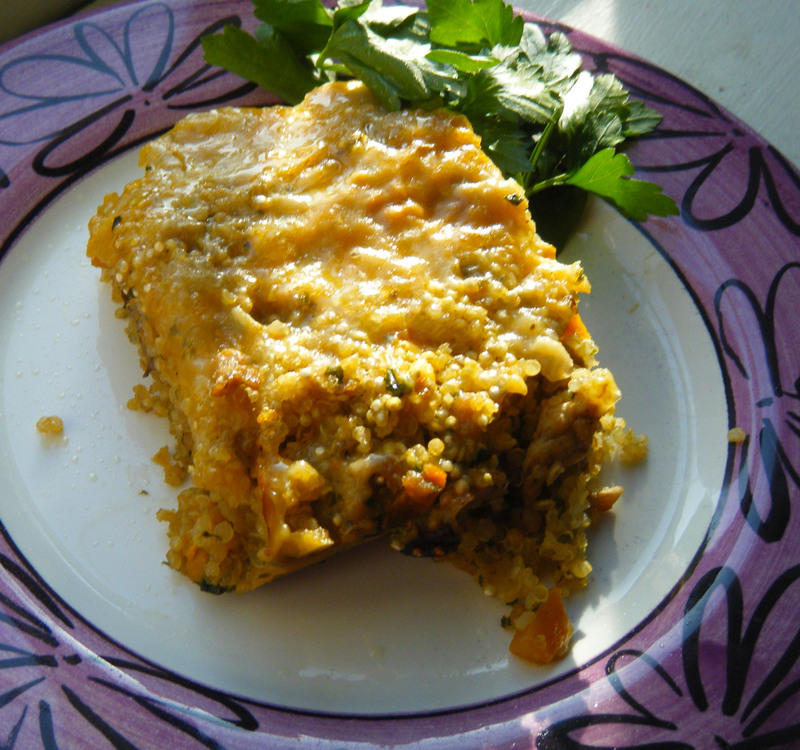 I came across the recipe for Cozy Quinoa Casserole and adapted it. Again, I feel virtuous eating it. But the flavor is what keeps me coming back for more. In a skillet, sauté onion in olive oil on medium high heat for 2 to 3 minutes or until translucent. Add mushrooms, squash, and garlic and cook for 2 to 3 minutes. Add chicken, breaking it into small pieces as it browns, about 3 to 4 minutes. Add ground thyme, salt, pepper, stock, and quinoa and bring to a boil. Reduce heat, cover, and simmer for 10 minutes. Spray a 13×9×2 inch baking pan with non-stick spray. Transfer ingredients from into the baking pan. Mix in parsley and ½ cup cheese. Sprinkle remaining 1 cup cheese on top of casserole. Bake in oven for 30 to 35 minutes. Wow Marion, it is so funny that you would post about Quinoa. I just finished reading an online list of foods that are great for weight loss and Quinoa was one of them. I had also heard previously that Quinoa is very healthy and good for you. I have been meaning to try it but I just didn’t know how to prepare it. Now I have a great recipe, I will definitely be giving it a shot. Thanks. Love this idea – I have a huge container of quinoa and am trying to find some delish recipes that use it. Great post! Thank you! I think you’ll like it. BTW I love your blog!